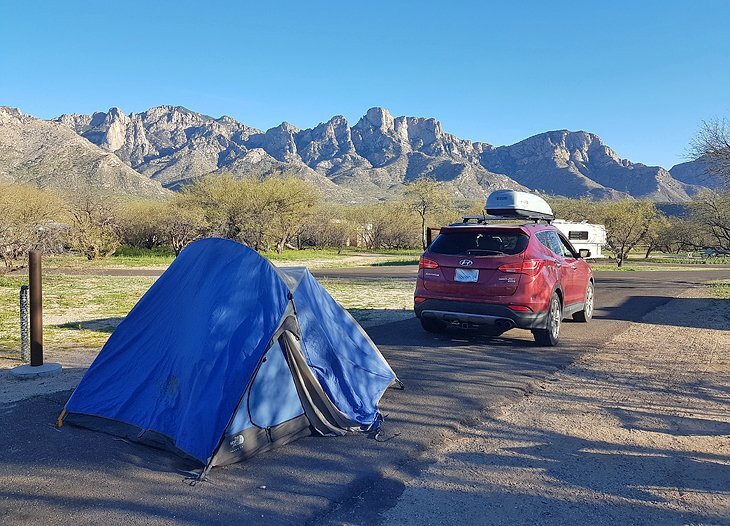 Just 15 miles from the heart of downtown Tucson, on the northern edge of the city, Catalina State Park offers some amazing camping. Campgrounds A and B are two camping areas in the park, almost adjacent to each other, and both offer outstanding views to Mount Lemmon and incredible wildlife viewing. You can expect to see vermillion fly catchers, hear owls hooting at night, possibly spot a bobcat, and almost trip over prairie dogs everywhere in the campground. Two of the most popular hiking trails in the Tucson area leave from this region of the park and are just a five-minute drive from the campgrounds. Each site has a picnic table, but shade is hard to come by. Sites are huge, with flat parking pads. Small trees offer some privacy and attract birds. The two campgrounds combined offer 120 drive-in sites, each with water and a majority with electricity, and free Wi-Fi. Facilities includes showers, restrooms, and a dump station. All sites are reservable for up to 14 days and should be booked well in advance. You can reserve online or by phone. This is an incredibly popular campground.